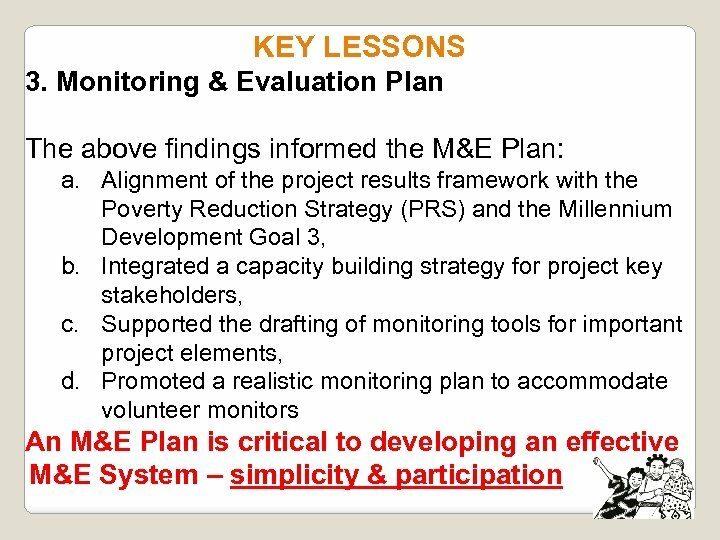 OVERVIEW Monitoring & Evaluation efforts have been undermined by two inhibitors: 1. 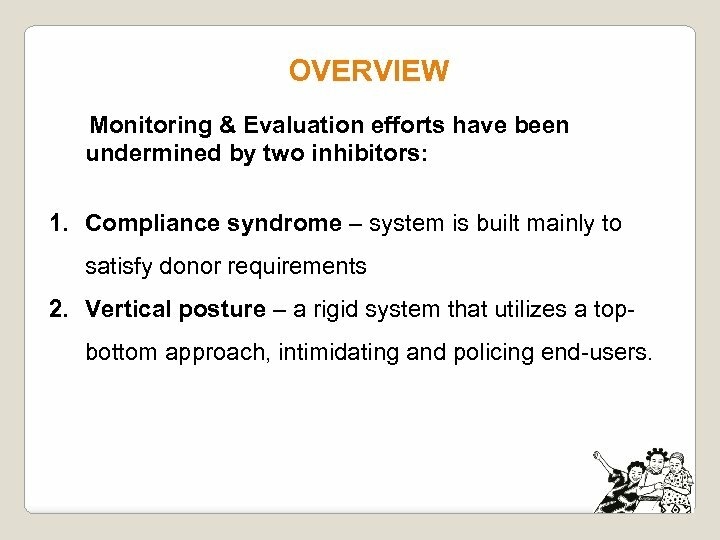 Compliance syndrome – system is built mainly to satisfy donor requirements 2. Vertical posture – a rigid system that utilizes a topbottom approach, intimidating and policing end-users. KEY LESSONS 1. Operational Manual The Operational Manual (OM) was somewhat detached from prevailing reality: a. No capacity building plan for SPs, b. 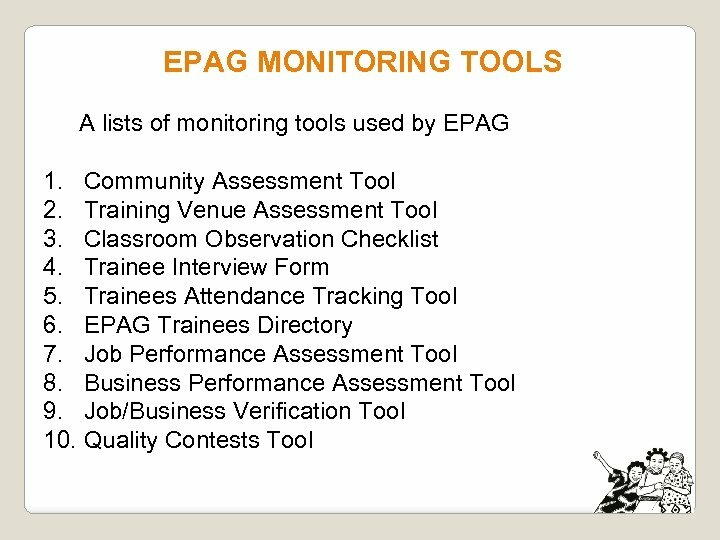 Different scores weight on indicators (e. g. training venues should not be in a noisy area), c. Did not have tools for monitoring critical design elements (child care, job/business performance, employment verification, etc. ). 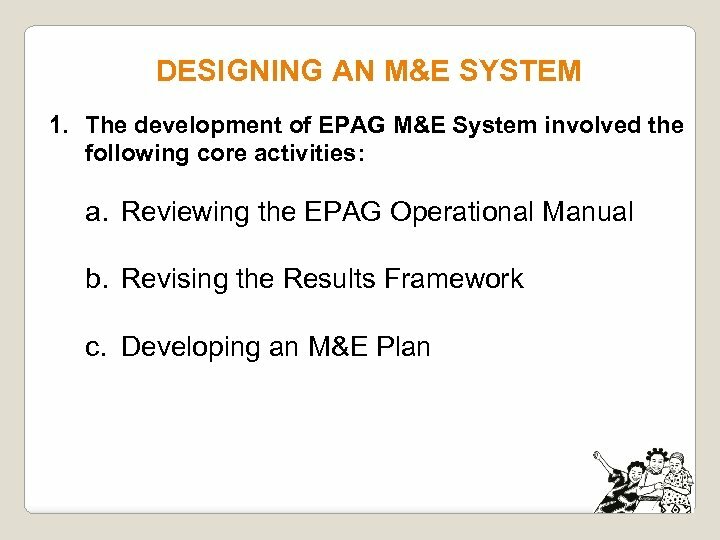 The Operational Manual must be harmonized with prevailing operational needs of the project. KEY LESSONS 2. 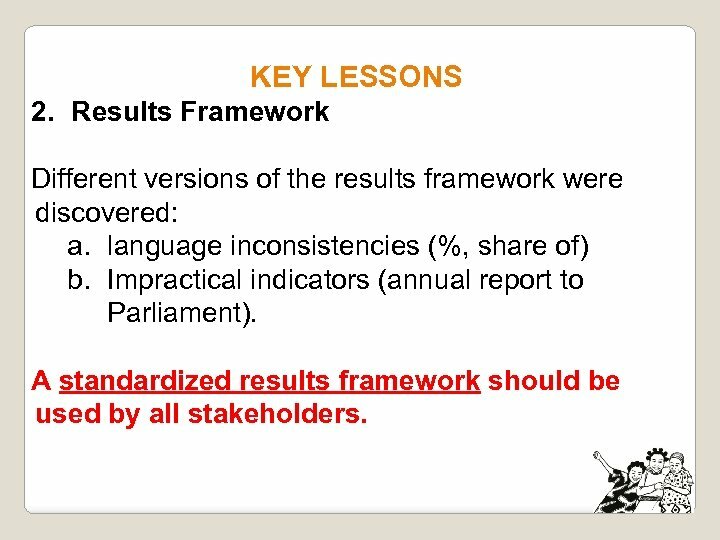 Results Framework Different versions of the results framework were discovered: a. language inconsistencies (%, share of) b. Impractical indicators (annual report to Parliament). 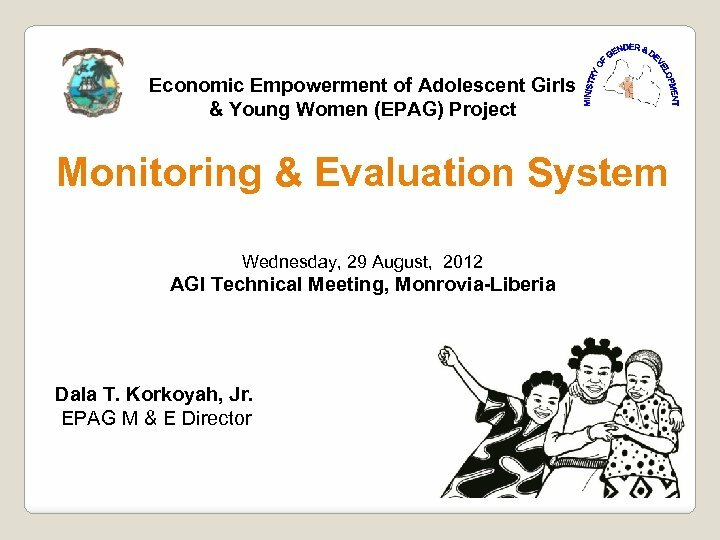 A standardized results framework should be used by all stakeholders. 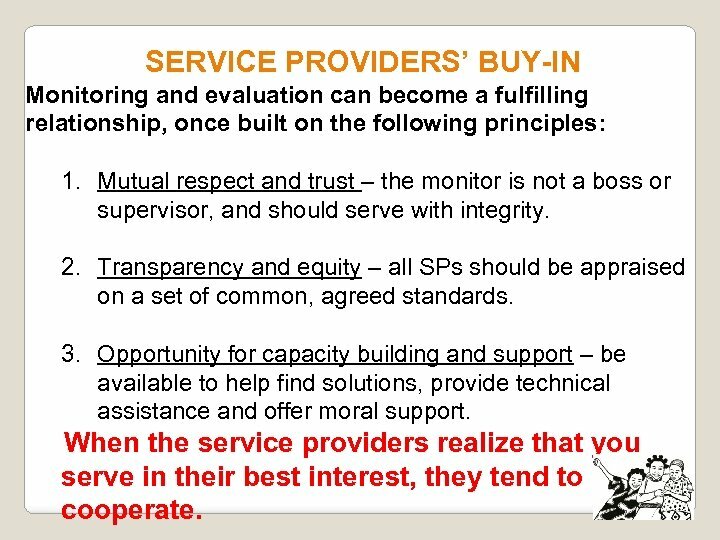 SERVICE PROVIDERS’ BUY-IN Monitoring and evaluation can become a fulfilling relationship, once built on the following principles: 1. 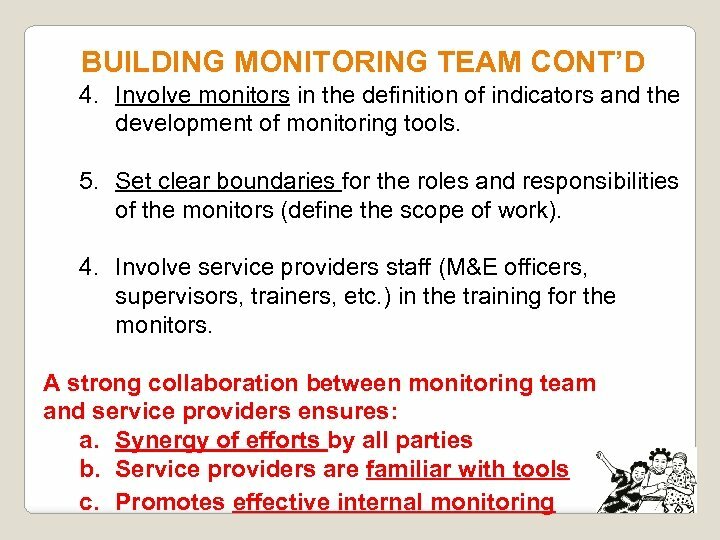 Mutual respect and trust – the monitor is not a boss or supervisor, and should serve with integrity. 2. Transparency and equity – all SPs should be appraised on a set of common, agreed standards. 3. Opportunity for capacity building and support – be available to help find solutions, provide technical assistance and offer moral support. When the service providers realize that you serve in their best interest, they tend to cooperate. 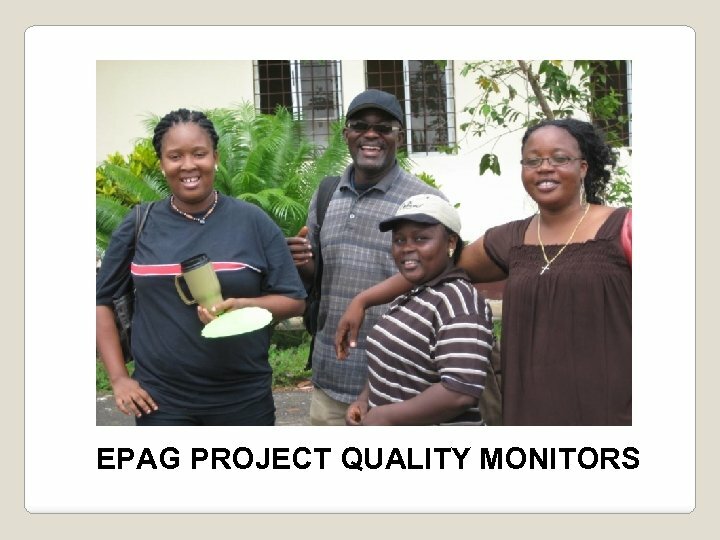 BUILDING MONITORING TEAM The overall team characteristics have great influence of the quality of service: 1. Recruit and contract qualified monitors– academic, previous experience working with similar target group (monthly stipend provided on daily rate). 2. 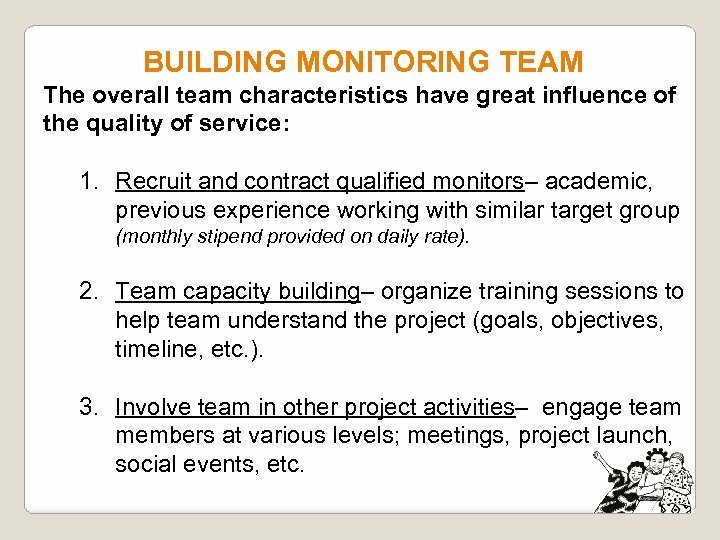 Team capacity building– organize training sessions to help team understand the project (goals, objectives, timeline, etc. ). 3. Involve team in other project activities– engage team members at various levels; meetings, project launch, social events, etc. 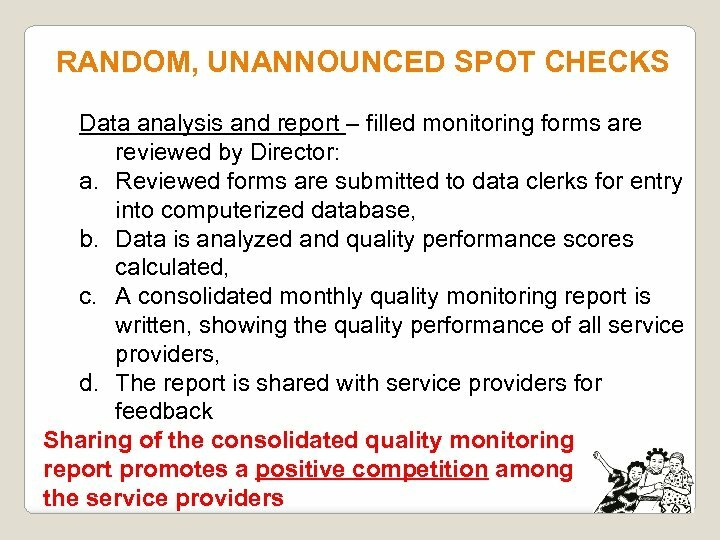 RANDOM, UNANNOUNCED SPOT CHECKS The strategy that kept service providers on ‘their toes, ’ sending a clear message for quality improvement: 1. 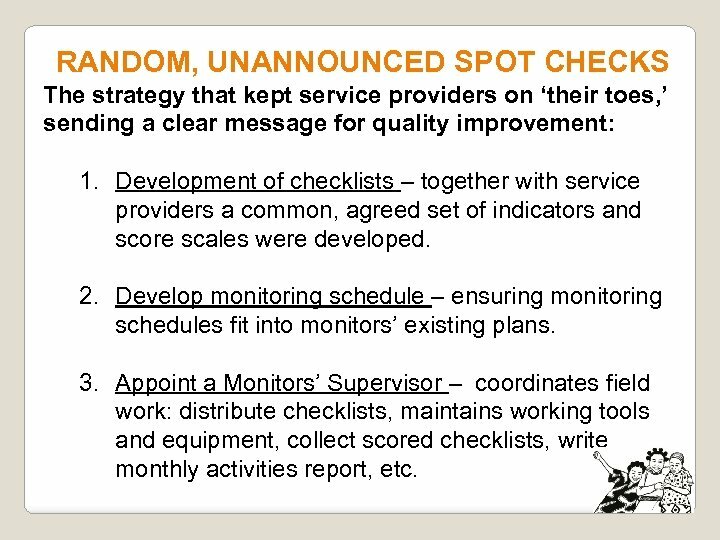 Development of checklists – together with service providers a common, agreed set of indicators and score scales were developed. 2. 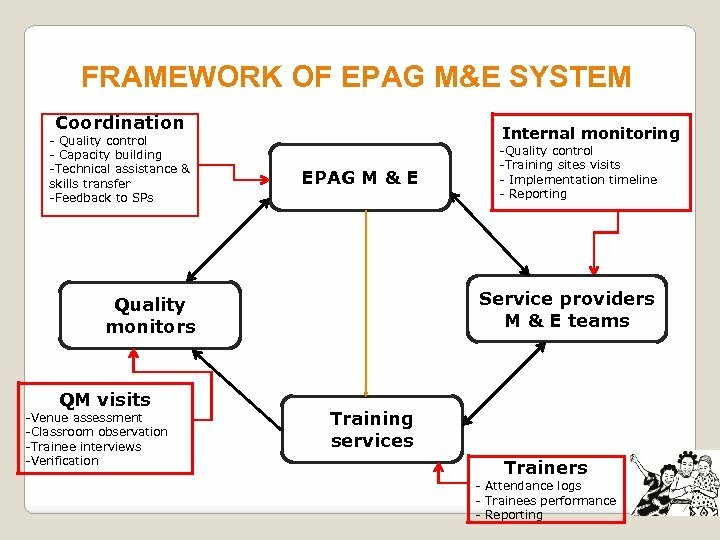 Develop monitoring schedule – ensuring monitoring schedules fit into monitors’ existing plans. 3. 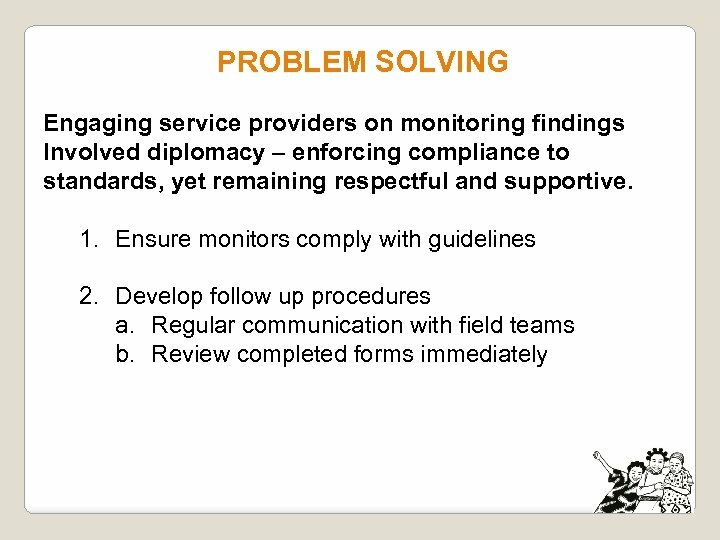 Appoint a Monitors’ Supervisor – coordinates field work: distribute checklists, maintains working tools and equipment, collect scored checklists, write monthly activities report, etc. RANDOM, UNANNOUNCED SPOT CHECKS 4. 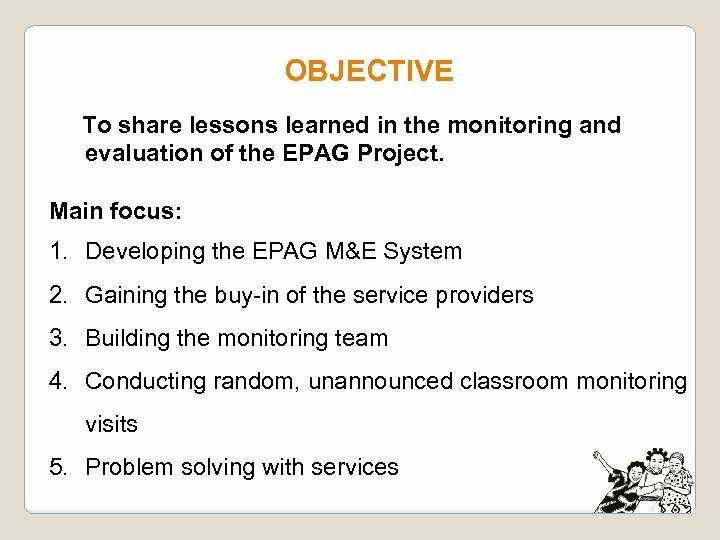 Weekly classroom monitoring – the monitoring plan allowed for two days of monitoring per week 5. 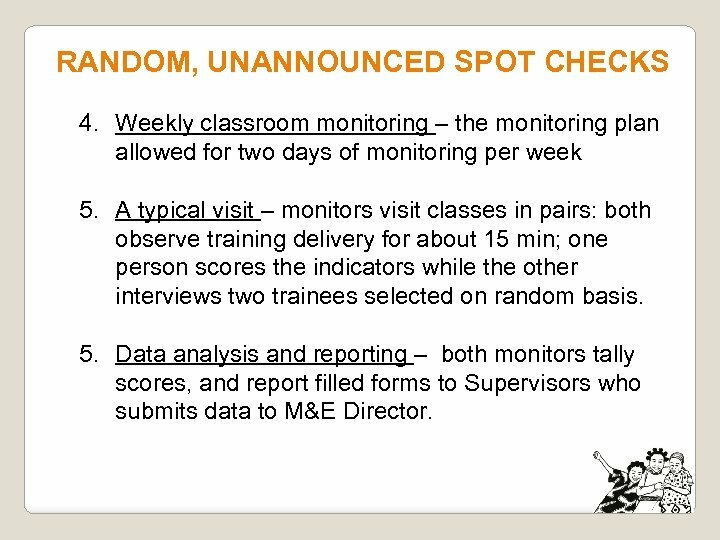 A typical visit – monitors visit classes in pairs: both observe training delivery for about 15 min; one person scores the indicators while the other interviews two trainees selected on random basis. 5. 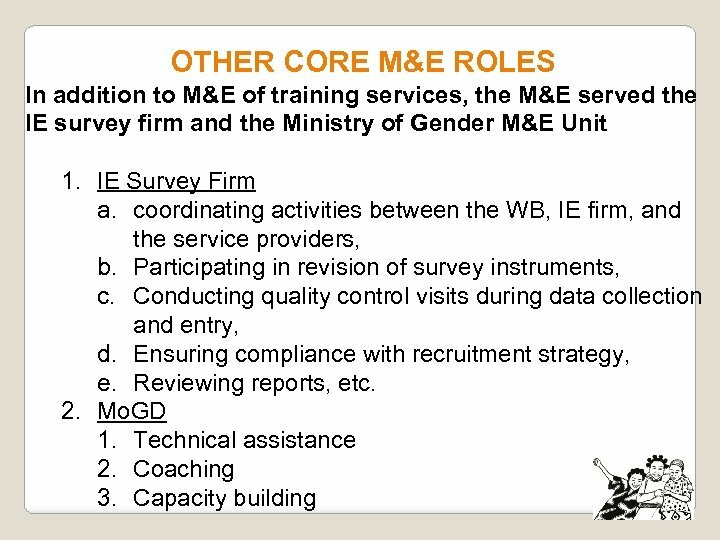 Data analysis and reporting – both monitors tally scores, and report filled forms to Supervisors who submits data to M&E Director. PROBLEM SOLVING 3. 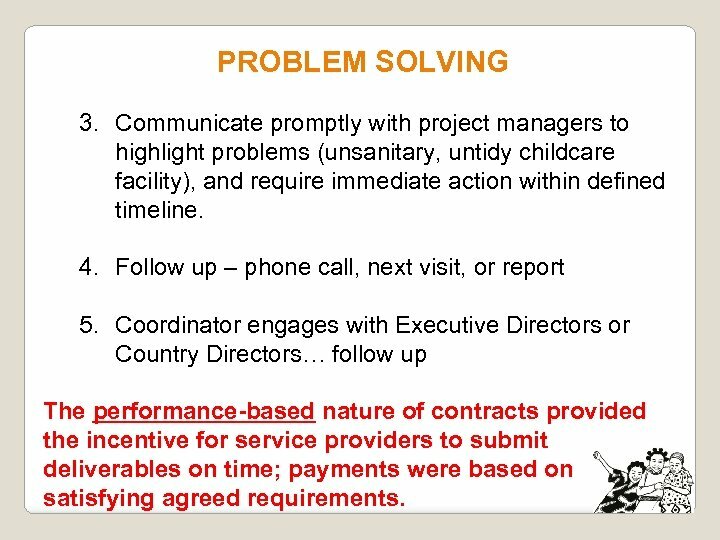 Communicate promptly with project managers to highlight problems (unsanitary, untidy childcare facility), and require immediate action within defined timeline. 4. 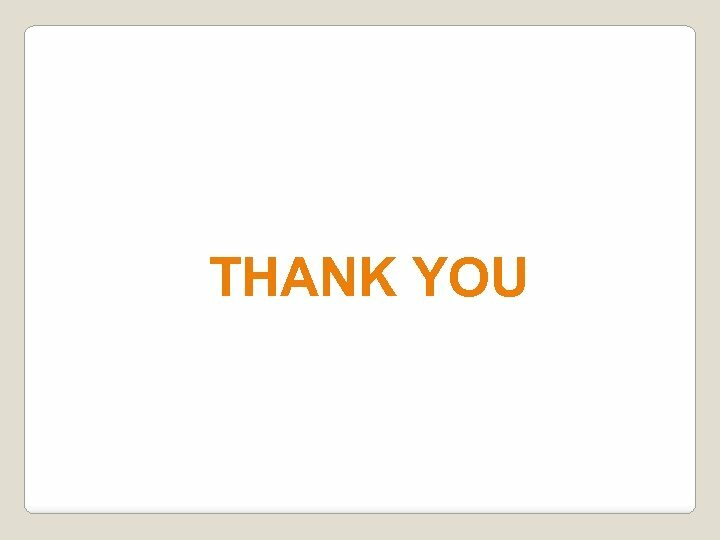 Follow up – phone call, next visit, or report 5. 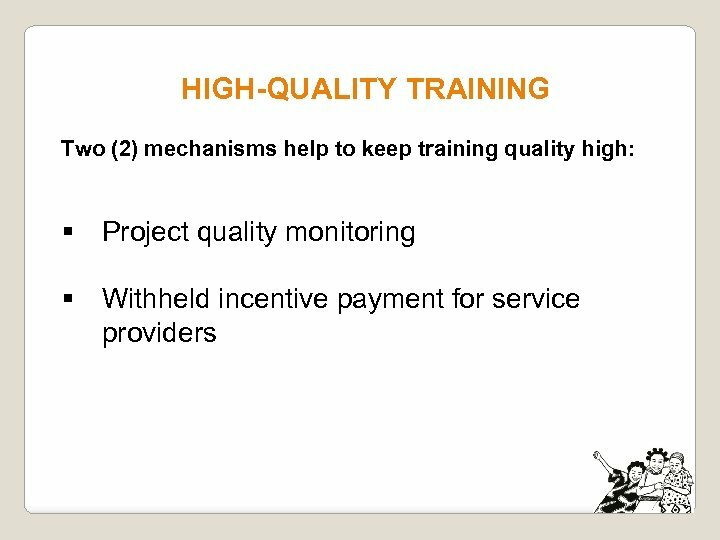 Coordinator engages with Executive Directors or Country Directors… follow up The performance-based nature of contracts provided the incentive for service providers to submit deliverables on time; payments were based on satisfying agreed requirements.